Lowest prices guaranteed on Man and Van | Removals in SW20 Raynes Park, from as little as £15 per hour + A large fleet of fully insured vans backed by a dedicated team of professionals. Do you need a professional, reliable Man and Van, to move home/office or just a few items in SW20 Raynes Park London? Movevan Man and Van, Removals services in Greater London and surrounding areas at affordable prices. 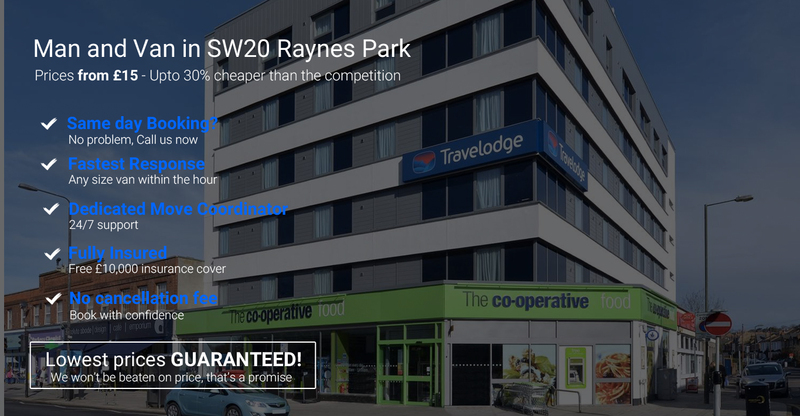 We guarantee that we are the cheapest in SW20 Raynes Park and the surrounding Areas We Cover, you will want to tell everyone about movevan.co.uk. Movevan.co.uk Man and Van service can provide a whole host of services for clients in SW20 and surrounding areas. Our man and van Raynes Park, SW20 are friendly, reliable and professional. We have years of experience in moving people all over Raynes Park, London. We are experts in our field, we can move you in or out without any stress. Try us today! We promise not to disappoint you.